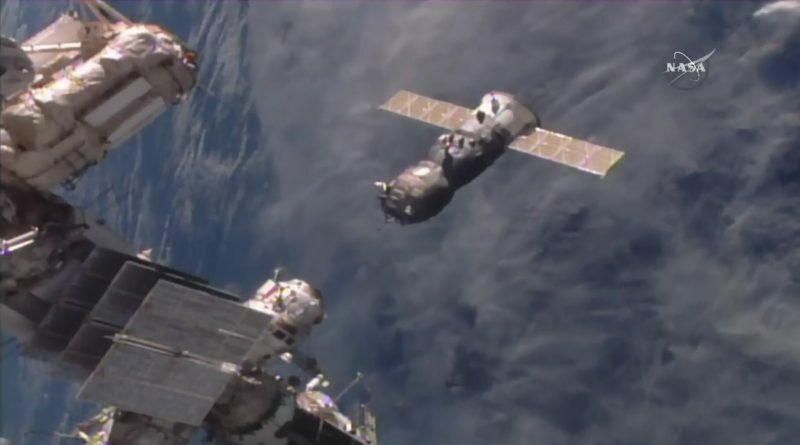 The Progress MS cargo spacecraft was taken for a spin on Friday, undocking and backing away from the International Space Station and brought back in for re-docking under manual control as part of a test of the remote-controlled rendezvous system. Progress MS is the first of the new line of MS spacecraft to fly, having been launched on December 21, 2015 atop a Soyuz 2-1A rocket. Two days of extensive tests were carried out while Progress was en-route to ISS, demonstrating new features such as communications through Russia’s Luch Data Relay Satellites, autonomous orbit determination and a new Unified Command and Telemetry System. Russia’s space program has the big advantage of flying two very similar spacecraft to send crews and cargo into orbit, sharing a number of common systems and components, thus allowing modifications to be first demonstrated by the uncrewed Progress spacecraft before committing the crewed Soyuz to the same changes. Progress MS completed a flawless automated docking on December 23, marking the delivery of 2,400 Kilograms of cargo for the six crew members in orbit. 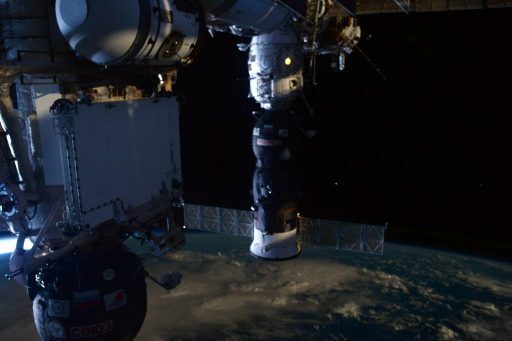 Spending over half a year docked to the Pirs module, Progress MS was unloaded, fuel and water was transferred and the crew placed no-longer-needed items aboard the pressurized cargo carrier and transferred liquid waste to the vehicle. A small fluid leak from the craft’s urine-filled Rodnik tank developed in May but was of no concern for the remainder of the mission. The undocking – re-docking test was part of the testing program, providing an opportunity to check out the Telerobotically Operated Rendezvous System (TORU) that allows the crew aboard ISS to assume control over the Progress and fly it in for a manual docking. As part of the MS transition, the flight software of Progress and Soyuz was modified, requiring validation of the upgrade and the test also checked a new signal converter installed on the ISS side after a TORU failure during the December docking of the vehicle. Progress was buttoned up on Thursday with the crew removing hand rails and installing the docking mechanism before powering up the spacecraft and closing the two hatches on Progress and Pirs for the standard one-hour leak check. 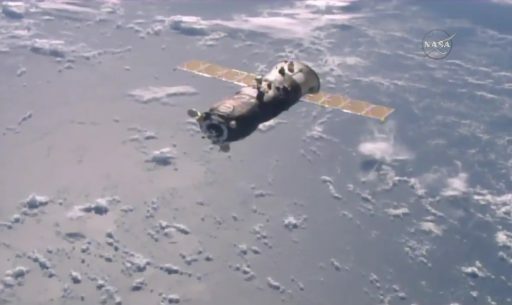 The docking mechanism was powered up early on Friday and ISS completed a re-orientation to allow the Progress to fly along the velocity-vector for the brief period of free flying. 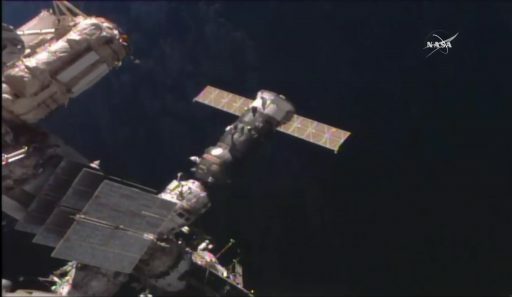 The undocking command was issued to initiate the opening of hooks within the docking mechanism so that loaded springs could push Progress and ISS apart. 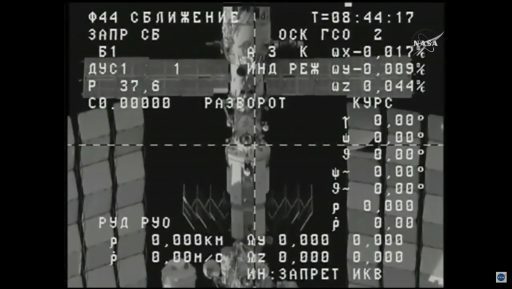 Physical separation was confirmed at 5:36:36 UTC and Progress drifted away from ISS at a speed of 0.12m/s following the initial push by the springs in the docking mechanism. Backing away, Progress was monitored by Alexey Ovchinin and Oleg Skripochka who were at the TORU control station inside the Zvezda module. The Cosmonauts used the translational and rotational hand controllers for manual flying of the vehicle. The spacecraft completed a pair of brief engine burns to accelerate its departure out to a stationkeeping point. After around 12 minutes, Progress had reached a distance of 190 meters and was transitioned to stationkeeping mode. The DPO thrusters of Progress were fired to initiate an initial closing rate around 0.3 meters per second and the Cosmonauts paid close attention to keeping the Pirs docking target in the center of the crosshairs seen in a calibrated camera view from Progress. While Alexey Ovchinin was actively flying the Progress, Oleg Skripochka other was monitoring the approach and manually measuring the vehicle’s range using the camera view provided by Progress via radio link. No issues were encountered during the rendezvous and Progress remained on target. A brief period of stationkeeping at 25 meters was used by Ovchinin to correct the alignment and zero-out any body rates before firing the DPO thrusters to initiate final approach at a speed of 0.15m/s. 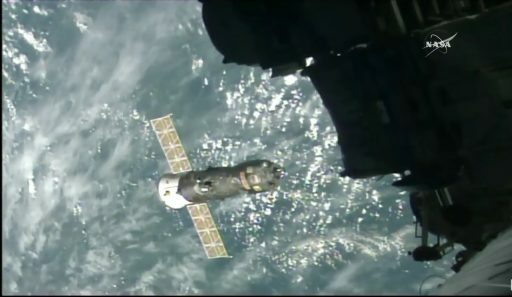 Contact and Capture was confirmed at 6:05 UTC after what appeared to be a very successful straight-out and straight-in maneuver of the Progress MS spacecraft. A small issue came up at the moment of docking when Progress incorrectly fired its DPO thrusters along the X and Y axes, creating a visible oscillation between Pirs and the spacecraft. Normally, only the X axis thrusters are fired to push Progress in at the moment of contact to engage capture latches. Why the Y thrusters were fired on Friday is under investigation. The docking probe was again retracted and hooks closed after relative motion had dissipated to establish a hard-mate between Progress and ISS for the remainder of its stay at ISS that will only last until Saturday night. 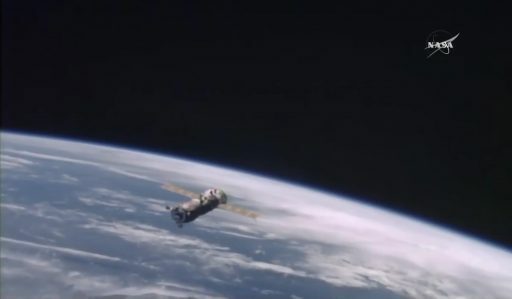 Hatches to the Progress will remain closed as the spacecraft is set for its second and final undocking on Sunday at 3:48 UTC, this time firing its thrusters to depart the vicinity of the Space Station, opening a gap before performing its deorbit burn at 7:03 UTC. Dropping out of orbit, Progress will meet its fiery end over the Pacific Ocean, burning up to a large extent with any surviving debris falling into the ocean, away from populated areas or busy shipping lanes. The next Progress will launch on July 16 and complete a two-day rendezvous in the continuing test program of the MS upgrades which are expected to be the last major round of systems improvements on the Soyuz and Progress spacecraft. Soyuz MS will make its debut next week, lifting off from the Baikonur Cosmodrome early on July 7 (UTC) with the ISS Expedition 48/49 crew of Anatoli Ivanishin, Takuya Onishi and Kate Rubins. New systems hosted by the MS version of the Progress include the KURS NA navigation system that is more accurate than its predecessor while also reducing the amount of antennas that need to be deployed by the spacecraft, now hosting only one fixed KURS NA antenna and two ASF antennas that deploy after launch. A Phased Array Antenna installed on the spacecraft allows Progress MS to communicate with Luch 5 data relay satellites in Geostationary Orbit for a continuous link to Mission Control. The Kvant-V radio system is being replaced by a Unified Command and Telemetry System, ending the reliance on Ukrainian-built parts for the Progress. Other changes on the spacecraft include the addition of external debris shields, the implementation of a backup drive mechanism in the docking mechanism and the inauguration of external compartments that can be used to release small CubeSats into orbit.